Will Eisner. Profession - Cartoonist. Buy at Amazon. 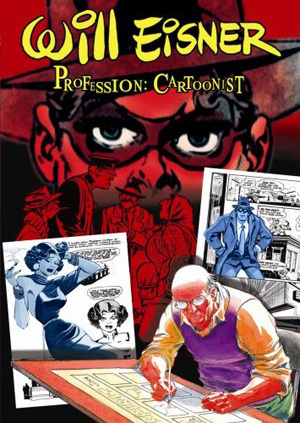 This award-winning, three-part documentary from 1999 explores the remarkable and lengthy career of Will Eisner, a pioneering cartoonist whose work continues to impact popular culture. Part 1: "Spirit" All about Eisner's most famous character, The Spirit, who debuted in 1940 and has been continuously published around the world. Part 2: "The Dream" Eisner's dream of being recognized as an artist through his media is revealed, including how his meetings with underground cartoonists in 1978 led him to produce his first graphic novel which revolutionized the field. Part 3: "Master Class" Eisner demonstrates at his drawing board the techniques related to his books, Comics and Sequential Art and Graphic Storytelling and Narrative. Aired on TV in 36 countries, this documentary features interviews with Art Spiegelman, Bill Sinkiewicz, Denis Kitchen, Jerry Robinson and Ann Eisner, plus Brazilian cartoonists (Angeli, Guazzelli, Lailson, Mauricio de Souza, Ota, Ziraldo) and French and Belgian artists Jano and Francois Shuiten.